Built in 6350mAh big battery with 5V/2A fast charging, the Power 3L fuels your daily work and entertainment needs. 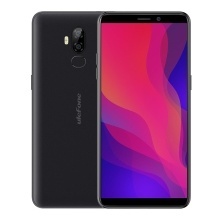 The Power 3L features a large 6.0-inch 18:9 screen at a 18:9 aspect ratio and delivers an unprecedentedly pure and broad vision, creating a fully immersive experience. The Power 3L is equipped with MT6739 64-bit 1.5GHz Quad -core processor for delivering premium performance at lightning speed, combined with 16GB+2GB of storage, offering smooth and easeful user experience. 13MP+5MP dual rear camera with dual flash also has excellent performance in taking pictures with less noise no matter in day or night. Adopts smart facial technology and fingerprint scanner for fast making your phone unlocked, greatly protecting your personal data in a more secure and reliable way. Smoother, faster and smarter, the Power 3L runs optimized and customized android OS, which shapes a ultra-fast operation and smart UI. Phone Unlocked Way: Fingerprint scanner, Face ID. Other Functions: Dual SIM, BT, WI-FI, GPS, 4G Network etc.